Joe Clare’s private collection grows each year and is a significant contribution to the arts. Kindness, thoughtfulness and respect of nature, human and divine are present in all the artwork that Joe Clare collects and supports. “Doing research over the years, and interviewing many artists, I have seen that the creative impulse reveals itself in art,” said Joe Clare. Dedicating himself to promoting art and artists and culture throughout humanity, Joe Clare has supported artists in Cuba and Canada, and South Africa and the US. His collection at this point numbers just under 150 works and is growing with both commissions and acquisitions for his own private collection and the collections of other national and international collectors. “Works that create meaning and express the divine on the deepest and subtle levels of all of humanity” are his criteria for the collections. In just over one year, his direction identified several primal artists whose expression is significant and worthy of attention. To be clear, his eye doesn’t select work that would be considered “spiritual” but rather artwork that is significant in and of itself; work that is without pious trappings or pretentions to so-called inner meaning or spirit world communications. Joe has the deepest respect for the creators of the works in his collection, and this trust between the supported artists and Joe is mutual. As a result, a positive sense of abundance is shared by all universally. 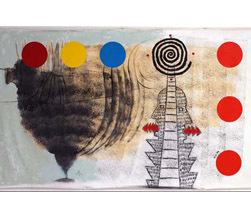 His friendship with selected artists is alchemical, transforming both the artist and the collector. The goal of alchemy is to transform base metals into gold, which could be called love. It is this love of both humanity and the creative impulse that infuses all things – the birds, the bees and the flowers and the trees, whether abstract or figurative – that makes the joyful intensity that is behind Joe’s love of the universal language of art. 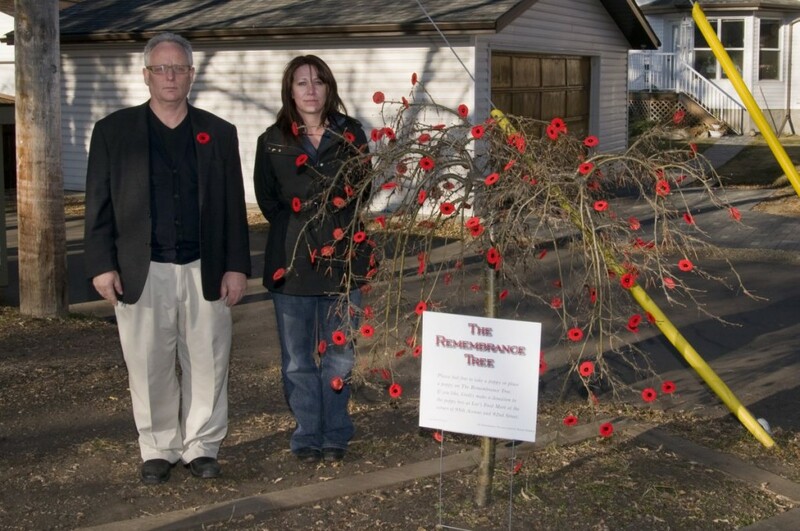 A November 11 (Veterans Day) “Remembrance Tree” has been started in the Strathearn neighborhood of Edmonton by Joe Clare and Brandi Elderkin. A sign below the tree invites passers-by to leave their own or take a fresh poppy from the tree. Contributions to the Veterans can be made at nearby Lee’s Food Mart. This collection of 7 ‘masks’ embodies the mystic purity of humour through silent stories that delight or provoke: symbols of personae. These abstracted mask-faces confront the mischief within existence, allowing consideration of life’s trickiness with humour. 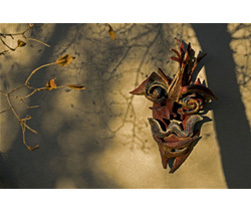 Like jesters, the colourful masks are playfully telling stories to teach. Each mask is a truth told with merriment. This revision of thinking encourages a more magical outlook. Predicated on Joe Clare’s vision to utilize a stucco-like texture for this work, a search for the ‘right’ material brought us to the Durabond facility in Edmonton, where an amazing flexible cement construction application is distributed. In addition to finding the perfect sculptural substance, Jaromer Kaszewski, Edmonton’s Durabond manager heard my plan, and offered workspace to enable the production of Revisioning and Auricle. Jaromer consistently provided welcome professional technical advice throughout the entire project. Beginning with a (approx.) 4’ x 4’ x 3’ block of Styrofoam™ for the 4 Auricle works, and a bundle of Styrofoam™ sheets to create individual, unique segments of Revisioning (7 masks), and armed with a QC Hot Knife™ tool, provided by Durabond to carve out the material, I began to first draw and then shape the extruded polystyrene foam. The cutting and shaping of hundreds of mask parts took approximately 10 days of working 9.5 hrs a day, 5 hours on Saturdays. Carving of the 4 Auricle works, hewn from the solid block took several days. After shaping the mask parts (Revisioning) and solid shapes for Auricle, I began wrapping each distinct part in sticky fibreglass mesh. This net would enable the first thin coat of Durabond Monobase™ to adhere, surface cement that would begin to build the durable surface to ensure weather resilience and stability. Durabond’s expert technician, Pablo mixed dozens of pails of this coating to fortify the Styrofoam™. The Durabond Monobase™, although dry to the touch in a few hours, was ready for the second, thicker layer of this material around 24 hours after the application. Applied with a palate knife, this substantial layer required a uniform application would be paramount to create strength of each piece. The finished mask structure needed consistent application to prevent compromised joints. 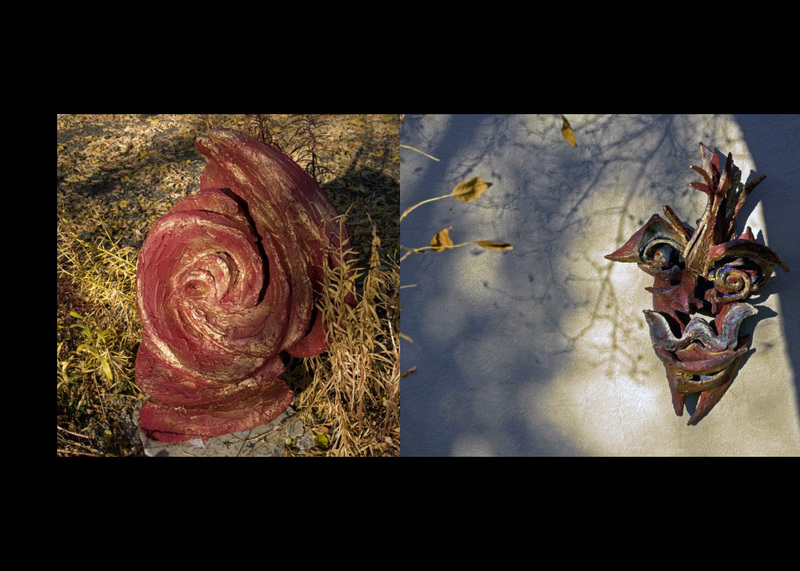 Using the same application process on the Auricle sculptures, the only difference was the amount of the material needed to coat a substantial size increase of the Auricle work. Each pail of Durabond Monobase™ had a 2-hour working window. Mixing larger pails of Monobase to use dealt with this size difference. After 72 hrs of drying time, post application, the task of assembling the individual mask parts of Revisioning began with impaling each part with custom cut steel rods. After deciding on an exact location of the joints between pieces, a mesh square, as an intermediary bond reinforced the Durabond cement that would secure each integral shape. Pounding the steel rod through the 2nd thick coat application reinforced the joints. Each distinctive shape of Revisioning mask parts had unique challenges in assembly. Not one piece was the same, uniform. 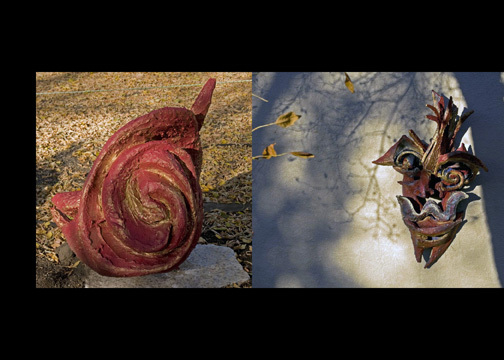 Utilizing inventive assemblage techniques ensured the secure formation of each sculpture for exterior wall installation. Assembled Revisioning masks and Auricle pieces required the final Durabond Brush Coat™, pigmented flexible cement. Applied with a brush, this waterproof application provides an impervious surface to weather Edmonton seasonal conditions. Durabond’s expert, Pablo, mixed the brilliant custom colours for the topcoat. Once the work was complete (6 weeks from first cut to last colour Brush Coat™ stroke) and transported to the installation site, Graham Burns of ANT bestowed the project with his talents as the installation technician extraordinaire. Hoisting each piece to the scaffold, multiple measurements made certain the 12” and 14” Durabond securing screws drilled through the surface of each Revisioning mask in discrete locations held fast to the wall. The installation of Auricle required digging holes into the ground prior to drilling marble tableaus and inserting Rebar™ into the work that would hold each sculpture to the cement-secured stone. This sculptural process for Revisioning and Auricle was made possible by Joe Clare’s amazing vision, his appreciated financial support, each cheerful, contributing team member at Durabond and especially the kind, generous support of Durabond’s Jaromer Kaszewski and his team (Pablo and John), as well as Graham Burns’ adeptness and humour. Thanks also to Ron Snider for his moral support and photographic documentation. Special thanks for technical support from Jaromir Kaszewski at Durabond Products Limited, the leading manufacturer of architectural coatings. Link here for a full description of the production process. 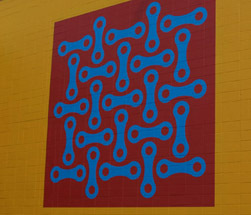 Technical assistance and support for the Auricle and Revisioning sculptures were provided by Jaromir Kaszewski at Durabond Products Limited, the leading manufacturer of architectural coatings. For full details on the production process for Auricle and Revisioning, Link HERE for the artist’s description of the work process. Still in the planning stages at this time is Joe Clare’s latest project, The Artist Workshop. It will offer selected artist residencies and exhibitions, and is in development. In Cuba, the Indian elder, Panchito, opens the exhibition with a tobacco ceremony. 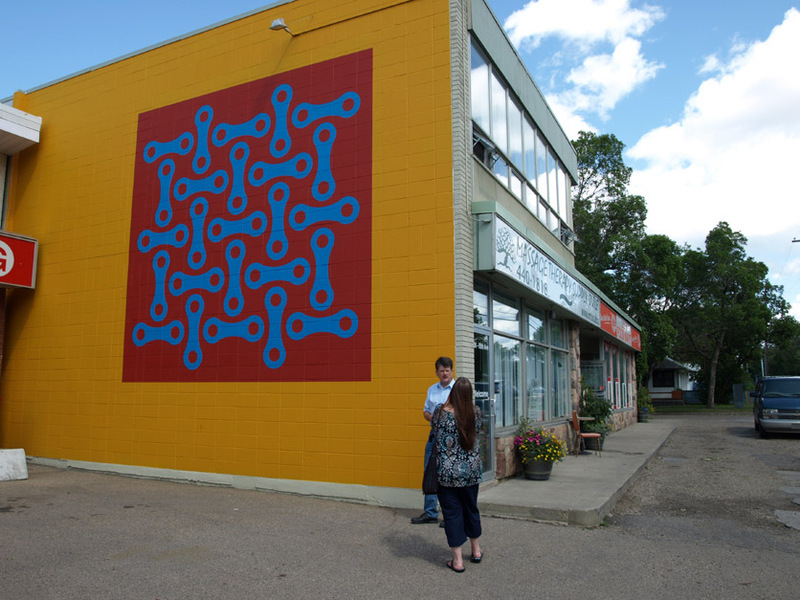 In this brief video, Joe Clare comments on the Free Rain mural in Edmonton at the opening last July.